Sub-Title: Probeblatt der neusten Bearbeitungen fur Stieler's Schul-Atlas und Ubersicht von Dr. G. Nachtigal's Reisen 1869-1873. Notes: Upper Left Corner: Petermann's Geographische Mittheilungen. Upper Right Corner: Jahrgang 1874 Tafel 14. 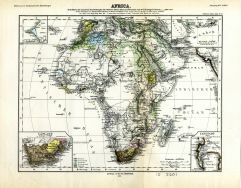 There are four insets --each for every corner of the map: upper left corner, depicting Cape Verde; upper right corner, depicting Aden; lower right corner, depicting Cape Town; lower left corner, depicting Cape Land (South Africa).